The Batcave map tries to recreate the life of Batman in a cubic world. You are waiting for the various elements of the scenery in a rather strange dark colors. Here you will be welcomed not only beautiful design elements, but still small redstone mechanisms. Batcave map will become even more interesting, if you download Pocket Heroes mod that adds a unique superhero. What could be better than a beautiful map for Minecraft PE with redstone elements? 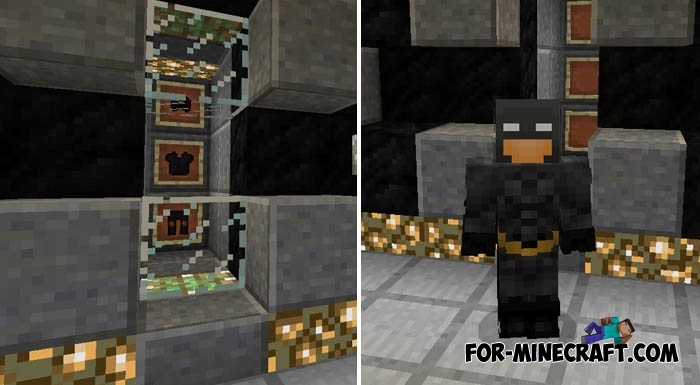 Batman mod for Minecraft PE 0.11.1 / 0.11.0It really is an unusual mod. After installation you will be able to easily turn into a superhero. You can become a Batman!